The destination, its hotels and hotel chains are included in the following categories: Best Destination in Mexico; Best New or Renovated Hotel, Mexico; Best All-Inclusive Hotel Chain, Mexico; and Best Luxury Hotel Brand. 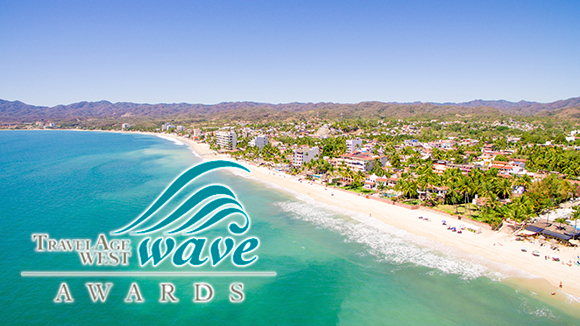 The nominations for the 2017 Travel Age West Wave Awards have been announced and the Riviera Nayarit, its hotels and hotel chains have been included in several categories, demonstrating once again that Mexico’s Pacific Treasure has all the right ingredients to become the best tourism destination in the country. Each category includes five candidates, which means sometimes there is more than one representative of a single destination on the same list. Voting is exclusively done by travel agents and ends on April 30, 2017; the awards ceremony will be held on June 15, 2017. The Riviera Nayarit is competing against Puerto Vallarta, the Riviera Maya, Cancun and Los Cabos in the category of Best Destination in Mexico, one that includes the destinations with the highest level of satisfaction among both tourists and agents. The Hotel W Punta de Mita is the destination’s newest resort and its quality has made an impression since it opened, which is why it’s been nominated in the category of Best New or Renovated Hotel, Mexico. The Best All-Inclusive Hotel Chain, Mexico category includes AMResorts and Hard Rock Hotels, both with properties in the Riviera Nayarit. The Riviera Nayarit is always a topic of conversation when it comes to luxury and this time was no exception. The St. Regis Hotels & Resorts and Four Seasons Hotels & Resorts are both in the category of Best Luxury Hotel Brands worldwide, and both have resorts in Punta Mita, the Glamour Peninsula of the Riviera Nayarit. It’s worth noting the Mexico Tourism Board (MTB) is nominated among the tourism offices on a global level that best support travel agents, competing against those of Australia, Jamaica, New Zealand and Tahiti. For more details on the categories and the nominees please visit: http://www.travelagewest.com/content/waveawards/Ballot.aspx?ballotid=91.